By romein, February 28, 2008 in Plugins - Publishing ONLY! The Multi Color Gradient plugin helps you to create and edit a Multi-Color Gradient. This is usually "C:\Program Files\Paint.NET\Effects"
The effect is located in the Effects->Render submenu it now appears in the Effects Drop Drop-down Menu. Select the type of gradient, Linear, Radial, or Square. A Linear gradient is defined along a line specified by the width of the image and the direction of the gradient. A Radial or Square gradient is defined from the center to the boundary of the image. For a Linear gradient drag the Angle slider to change the direction of the gradient. Drag the Count slider to change the color count. Select the colors by clicking the color picker control. Drag the position sliders to change the postions of the interpolation colors. The color positions in the control specify percentages of distance along the gradient line. For example, a value of 20 specifies that this point is 20 percent of the total distance from the starting point. The postions in this control are represented by values between 0 and 100, and the first color in the gradient must be at position 0 and the last must be at postion 100. Click the randomize parameters button (dice button) to try out random settings in the preview dialog. Click the default values button (arrow button) to restore the default values. this seems cool! well done and thanks!! I was thinking about something like this a few days ago when I had to make multiple layers with a different gradient color over each. This sounds like it might save a lot of time. I'll have to give it a whirl when I get off work. I haven't touched it yet, but it looks awesome! Would you be able to add an option to selectively define the center of the radial and square gradients? Maybe in the next version. In the original design you can move, resize and rotate the entire gradient. Question: could someone explain to me how this one is different from the one under adjustments called gradiant mapping? Oma, This creates a gradient. Pyro's plugin adds a gradient map to your existing image. Ok I'll give it a whirl. see what I think of it. if there are any modifications I'd like to see I'll come back and mention them. definetly a keeper plugin. like especially the ability to enter hex code values for colors on the pallett. it will most likely replace my use of hue saturation. and love the transparency. aspect. changed this picture on left to picture on right in just a couple of steps. cut out the polar at the top and used plugin on just the selected image added the maze underneath layer to check how opaci it was and just a bulge to show distortion. very good A+ for ease of use from a non programer point of use application. . I just tried it. Wow. This can be really useful. Thanks romein. Cuts out the middleman from pyro's Gradient Mapping method. Nice work! Nice-looking UI, but it seems sort of superfluous, especially since its output doesn't really depend on the existing image. So why have a window showing the original image? I'm missing it as well pyro. and the three sections could you explain that for me. pallett, named colors i think I understand but what is that third one system for? 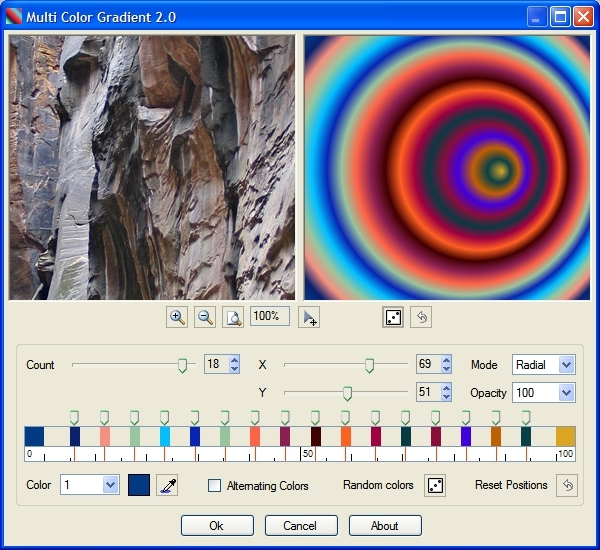 oma: System is a set of colors defined by your computer - they may vary depending on what OS you are using (Windows XP, Windows Vista), what kind of color scheme you are using, or what theme (Luna, Royale, Aero, Classic, Basic) you're using. Nevermind, I just saw the eyedropper. - When using the eye-dropper, and moving the mouse around, the redraw is excruciatingly long, and ends up with a trail of color-info windows several inches behind the cursor. Also, since you have preview windows, it's important that you- in the form's Load event- make sure to set the opacity of the dialog to 1 so what's under it does not show through, as that can really screw with what you think you see in the preview window. Better yet, use WinAPI to get the screen image so the eye-dropper doesn't need the preview windows at all. -The preview window is inaccurate - it shows the gradient spread over only the area shown in the preview window, yet when you OK the effect, the gradient is spread over the whole selection. Yet another reason to nix the pictureboxes and use the normal method of previewing on the canvas. Is there a way to add an option for choosing a blending mode? All I'm saying is this definitely seems like cowbell to me. Maybe you are able to answer a few questions about the plugin interface. I didn't have the time to figure out how to use the srcArgs.Graphics object efficiently (that's why I use these preview windows). If I draw a gradient I use a PathGradientBrush and Graphics.FillPath(). This is a vector operation. Just like drawing lines, text, polygons. This is clearly a raster operation. How do you solve this efficiently without the use of clip regions? romein, can you please put a [serializable] attribute on any custom Types you are using in the EffectConfigToken, so that this plugin can be compatible with ScriptLab?